This post appeared first on www.HenrysFork.org. Donate to Henry's Fork Foundation Today! Record precipitation in February moved snowpack from 80% of average on February 1 to 110% of average on April 1. Watershed-wide natural streamflow for April through September is forecast to be 105% of average, compared with 104% of average in 2018. 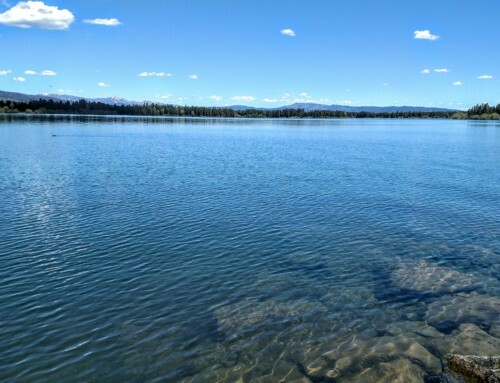 Delivery of water from Island Park Reservoir is predicted to begin around July 1 and remain in the range of 800-1200 cfs during July and August. Because of very good inflow, the reservoir is expected to end the irrigation season around 80% full, compared with 72% full in 2018. Higher water levels in Island Park Reservoir have numerous, scientifically documented benefits to the Henry’s Fork fishery, prompting HFF to continue to expand the number of methods we use to limit delivery of water from the reservoir. The watershed as a whole receieved at least 0.1 inch of precipitation on all but seven days during the month of February, and several precipitation records were broken in the watershed and elsewhere around the state during the month. Over the whole watershed, the record-setting month moved water-year precipitation from 85% of average to 120% of average and snow-water-equivalent (SWE) from 75% of average to 120% of average. March turned out to be dry, but below-average temperatures–as much as 15 degrees below average–kept existing snow on the ground, leaving SWE at 110% of average on April 1. Precipitation and SWE accumulation in January, February, and March greatly favored valley areas and the upper Henry’s Fork subwatershed over Fall River and Teton River. Warm temperatures and rain over the first week of April increased precipitation accumulation but decreased SWE. Nonetheless, SWE remains above average as of April 10. Precipitation as a percent of average, by subwatershed. Watershed-averaged temperature relative to average. Snow water equivalent as a percent of average, by subwatershed. In 2017, I developed a probabilistic (“stochastic”) model of the entire Henry’s Fork stream, reservoir, and irrigation system for the purposes of predicting streamflow and reservoir content for the upcoming irrigation season. The model is based on hydrologic conditions as of April 1. The most important output of the model is content of Island Park Reservoir at the end of September, what we term as “reservoir carryover.” In 2017, the model predicted carryover to within 1%. In 2018, the model underpredicted carryover by 7%, primarily because July, August and September were extremely dry, and more reservoir storage was needed late in the summer than expected. However, the observed value was well within the margin of statistical error. The 2019 version of the model includes several new features that make it more realistic, especially with regards to irrigation needs on the Teton River. The single most important component if the Henry’s Fork system that determines flow releases from Island Park Dam during the summer is need to deliver water from the Henry’s Fork to the Teton River via the Crosscut Canal to meet irrigation needs on the lower Teton. The Crosscut Canal diverts water from the Henry’s Fork at Chester Dam and delivers it to the Teton River just north of the town of Newdale. The model starts with predictions of natural streamflow over the April-September period. Over the whole watershed, natural flow is expected to be 105% of average, compared with 104% of average in 2018. However, much more of that natural flow will originate in the upper Henry’s Fork watershed in 2019, compared with higher fractions in Fall River and Teton River in 2018. With 90% probability, natural flow will be at least 87% of average. This means that under a worst-case scenario, streamflow will be at least 87% of average, which is still within the range that will lead to average carryover in the reservoir and at least average outflow the following winter. Predicted natural streamflow in the three subwatersheds of the Henry’s Fork watershed for spring and summer of 2019. As seen in the table above, streamflow on Fall River and Teton River is expected to be only slightly lower than last year. Overall, this will lead to mid- and late-summer flows in both of these rivers around average and very close to those seen in 2018. Need for delivery of water through the Crosscut Canal is expected to start in the last few days of June, just a few days earlier than last year. This will trigger need for delivery of Island Park storage water a few days later to meet irrigation demand and keep streamflow in the Henry’s Fork at St. Anthony at 1,000 cfs, the irrigation-season target that will most likely be used to determine Island Park releases. Streamflow there will hover near or just a little above 1,000 cfs for all of July and most of August. Graph of predicted streamflow in Teton River, compared with 2018 and the long-term average. Graph of predicted streamflow in Fall River, compared with 2018 and the long-term average. Graph of predicted streamflow at St. Anthony, compared with 2018 and the long-term average. As mentioned above, a much larger fraction of total streamflow will originate in the upper Henry’s Fork watershed in 2019, versus Fall River and Teton River. Inflow to Island Park Reservoir is expected to be 100-200 cfs greater in 2019 during the late summer than in 2018. Streamflow in the Henry’s Fork at Ashton is also expected to be greater than that in 2018 for most of the spring and early summer but below average during the middle of irrigation season because delivery of water from Island Park Reservoir is expected to be lower than average. Graph of predicted inflow to Island Park Reservoir in 2019, compared with 2018 and the long-term average. Graph of predicted streamflow in Henry’s Fork at Ashton during 2019, compared with 2018 and the long-term average. During spring runoff, outflow from Island Park Reservoir is expected to be a little higher overall than that in 2018 because of a better snowpack this year. However, because specific timing of high snowmelt and rain events is very difficult to predict, streamflow on any given day may be lower this year than last during periods when runoff was very high in 2018. As runoff recedes, streamflow at Island Park Dam will drop from about 1,200 cfs at the beginning of June to 700 cfs by the end of the month. Irrigation delivery is expected to begin around July 3, right at average. From then on, because irrigation demand relative to supply in Fall River and Teton River is predicted to be about like last year, outflow from Island Park Reservoir is predicted to be very similar to that in 2018–in the range of 800-1200 cfs most of the summer, with the highest flows occurring for only a few weeks during July. In September, once need for delivery drops and the reservoir can be held at a constant pool, outflow will be about 200 cfs higher than it was last year, because reservoir inflow will be higher. Reservoir carryover is expected to end up around 110,000 ac-ft (81% full), compared with around 98,000 ac-ft in 2018 (72% full). Higher inflows this year will keep the reservoir level higher, even with outflows about the same or even a little higher than in 2018. At worst (less than 5% chance), the reservoir will end up around its long-term average of 60,000 ac-ft (44% full). Graph of predicted outflow from Island Park Reservoir during 2019, compared with 2018 and the long-term average. Graph of predicted Island Park Reservoir volume during 2019, compared with 2018 and the long-term average. 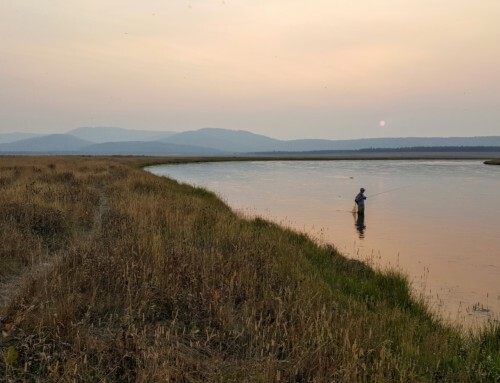 Research by Idaho Department of Fish and Game, Idaho State University (funded by HFF), and HFF itself dating back to the late 1980s has thoroughly documented the benefit to the Rainbow Trout population by maintaining high volume in Island Park Reservoir. In particular, higher carryover means less water to store during the winter, which leads to increased habitat for juvenile Rainbow Trout in Box Canyon, which leads to more two-year trout entering the population available to anglers the following year. These so-called “recruits” maintain the trout population througout the reach between Island Park Dam and Riverside Campground. Winter outflow from Island Park Dam averaged 504 cfs in 2017-18 and 560 cfs in 2018-2019, which will lead to strong recruitment in 2019 and 2020. The past two winters have seen the highest winter flow in two consecutive years since 1999 and 2000. Based on current predictions, winter flow next year will again be in the range of 500 cfs, extending the streak of high winter flows to three years. Even though at first glance most of this work seems to be very far removed from Island Park Dam itself, all of it is aimed at reducing the need for delivery of irrigation water from Island Park Reservoir, and all of it has been added to our programmatic work since the sever drought of 2016.